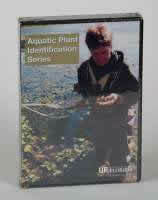 This four-disc DVD set was created for the benefit of aquatic plant managers, regulators, students and the general public, and uses everyday language to identify aquatic plants in Florida. Narrated by Dr. Kenneth Langeland. Features 14 of the most common floating and floating-leaved plants in Florida. Features 37 of the most common emersed plants in Florida. Features 24 of the most common submersed plants in Florida. Features 40 aquatic and wetland grasses, sedges, and rushes in Florida. Total run time for DVDs is 4 hours 31 minutes.